The Cumberland & Dumfriesshire Farmers Mart P.L.C. had forward 49 prime cattle, 31 over thirty month cattle, 7,134 prime lambs and 7,455 cast ewes & rams at their weekly sale at Longtown on Thursday 16th December, 2010. Prime cattle were a similar trade on the week with Limousin heifers selling to a top of 177.5p from Messrs W. & W. Faulder, Houghton House and purchased by W. Kirkup & Sons, Butchers, Longtown, others 174.5p Brydekirk Mains, 165.5p Smallholms and Brydekirk Mains, 162.5p Woodslee, 160.5p Woodslee; Blonde d’Aquitaine 176.5p Toppin Castle; British Blue 167.5p Houghton House; Charolais 163.5p Hallburn and Sceughdyke, 156.5p Sceughdyke. Bullocks to 171.5p for a Limousin from Toppin Castle, purchased by Border Meats, Butcher, Lockerbie, others 166.5p Dashwell Green, 164.5p Slealands, 163.5p Dashwellgreen and The Haining House, 162.5p Slealands, 160.5p Dashwell Green; Angus 163.5p Burnfoot on Esk; Charolais 162.5p, 157.5p Sceughdyke. Top price per head of £1,259 for a Limousin bullock from Dashwell Green, others £1,169 The Haining House, £1,140, £1,111 Dashwell Green, £1,092 The Haining House; British Blue £1,205 Becton Hall, £1,127 Sceughdyke; Charolais £1,137, £1,102 Sceughdyke. Limousin Heifers to £1,038 from Houghton House, £1,026, £922 Smallholms; Charolais £1,038, £1,032 Sceughdyke; Blonde d’Aquitaine £970 Toppin Castle. OTM cattle were a much improved show for quality and was met with a flying trade, many more could have been sold to vendors advantage. Limousin cows to 143.5p from L. Smith & Co., Roachburn and 142.5p from R.M. & P. Armstrong, Slealands, others 139.5p Slealand, 115.5p Roachburn, 113.5p Slealands, 103.5p Doorpool and Greenleycleugh, 102.5p Greenleycleugh, 101.5p, 98.5p Roachburn, 97.5p The Ash; Angus 117.5p Blindhillbush; British Blue 114.5p The Throp, 109.5p Doorpool, 108.5p The Throp; Charolais 105.5p Slealands; Simmental 96.5p, 94.5p Englishtown. Limousin bullocks to 133.5p Swaites. British Blue bulls to 115.5p Midtodhills. Top price per head of £1,004 for a Limousin cow from Roachburn, others £831 Roachburn, £822, £819 Slealands, £727 Greenleycleugh, £664 Roachburn; Charolais £854 Slealands; British Blue £743 The Throp, £700 Doorpool. An excellent show of lambs on Thursday selling to a full ring of buyers. The sale averaged 173.8p overall with the 5,323 SQQ lambs (32-50kg) averaging 176.5p. A large show of 50kg+ lambs were forward with good quality 38-44 kg lambs short of requirements. Please remember the prime sale will be on Tuesday 21st December next week at usual times. 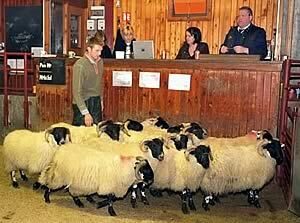 The sale topped at £102.50 for Beltex from Albierigg and 249p for Beltex from Naddle. Other Beltex £98.80 Albierigg, £89.50 Copperthorns, £81.50 Old Rectory; Suffolks £93.50 Lowes Fell, £93.20 Sceughdyke & Albierigg; Cheviot £87.50 Becks, £81.20 Sorbie, £79.20 High Stenries; Texel £102.50 Albierigg, £99.80 Nunscleugh, £98.50 Waltonwoodhead; Charollais £95.50 Leaona Villa, £94.20 Old Rectory; Halfbred £86.50 High Moat, £77.50 High Moat; Greyface £88.50 Old Police House, £83.50 Bennettsfield, £83.20 Middle Shipley; Cheviot Mule £76.80 Falnash; Blackface £80.50 Meggethead, £79.80 Copperthorns, £78.80 Milnmark; North Country Cheviot £78.80 Pilmuir; Swaledale £59.80 Coldshield, £58.80 Coldshield; Leicester £76.50 Coldshield, £75.50 Cairnside, £75.50 Westend; Llynn £74.50 Whitcastles; Kerry £76.50 Whitcastles. Light lambs to £87.50 for Beltex from Albierigg; Suffolks £66.80 Stirkoke Mains; Cheviot £64.20 Priesthaugh & Commonside & High Chesters; Texel £71.80 Glenart, £70.20 Haymont, £68.20 High Floweryhirst; Charollais £67.80 Colte Coates; Greyface £64.20 Peela Hill, £62.50 Brackenthwaite; Blackface £66.20 Scalehill, £63.80 Chapelhope, £62.80 Haystown; North Country Cheviot £53.80 Wydoncleughside, £51.80 Coldshield. The firm also had forward a monster show of cast ewes and rams, selling to the usual ring of buyers. Trade was £4-£5 easier on the week for large ewes but horned ewes and plains remained dear. Sale topped at £113.50 for Texel ewes from Linton House & Little Galla, £112.50 Oldfield; Suffolks £99.50 East Cliff, £98.50 Lowes Fell, £97.50 Blackburn, £95.50 Linton House; Charollais £88.50 Tirrilside; Greyface £74.50 Lowes Fell & Marygate, £73.50 Cowburnrigg; Cheviot Mule £81.50 Barnglies, £80.50 Altongate; Leicester £84.50 Acreside & Drinkstone, £82.50 Farnbury; North Country Cheviot £92.50 Waterfoot, £87.50 Westhouse; Beltex £66.50 Newton; Zwartbles £78.50 Stackbrae & Newbigging. Light ewes to £69.50 for Blackfaces from Crosskeys, £67.50 Lowes Fell, £66.50 Gibbs Hill; Cheviots £68.50 Westgate & Pilmuir, £66.50 Grindon Hill; Swaledale £60.50 Whitchester, £58.50 Parsonshields, £56.50 Stotsfold; Herdwicks £45.50 Hayside; Llynn £57.50 Newbigging. Goats £63.50 Allfornaught. Rams to £106.50 for Texels from Westfoot, £100.50 Coytre, £99.50 Coytre, £96.50 Little Galla; Suffolks £96.50 Linton House, £92.50 Burn House & Tirrilview; Cheviot £72.50 Pilmuir, £70.50 Tirrilfoot; Charollais £96.50 Altongate; Leicester £98.50 Nunscleugh, £90.50 Sheepriggs, £86.50 Blacksmiths Cottage; Blackface £76.50 Roughet Hill, £74.50 Brackenthwaite; North Country Cheviot £98.50 Oldfield; Swaledale £50.50 Whitchester; Beltex £78.50 Altongate; Easycare £70.50 Gatehousecote.